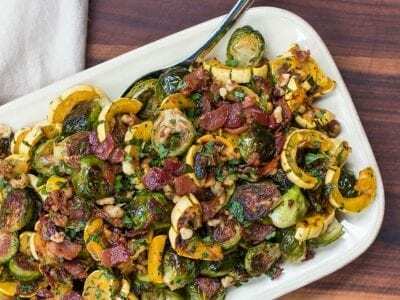 Roasted brussels sprouts and squash with crispy bacon fat dressing is the perfect side dish for Thanksgiving. This technique for oven roasted vegetables is the best way to cook veggies. There are so many flavors and textures going on in this vegetable dish! 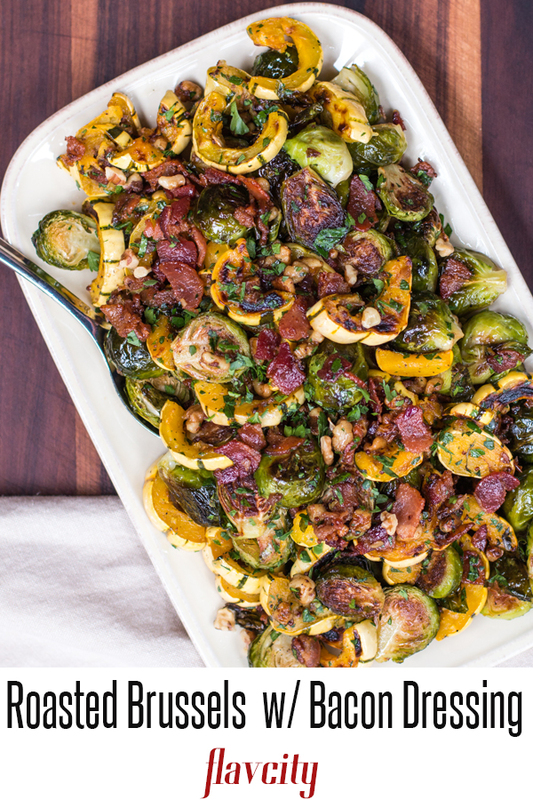 Salty bacon, tangy vinaigrette, crunchy walnuts, sweet maple syrup, roasted and caramelized Brussels sprouts, and delicata squash. 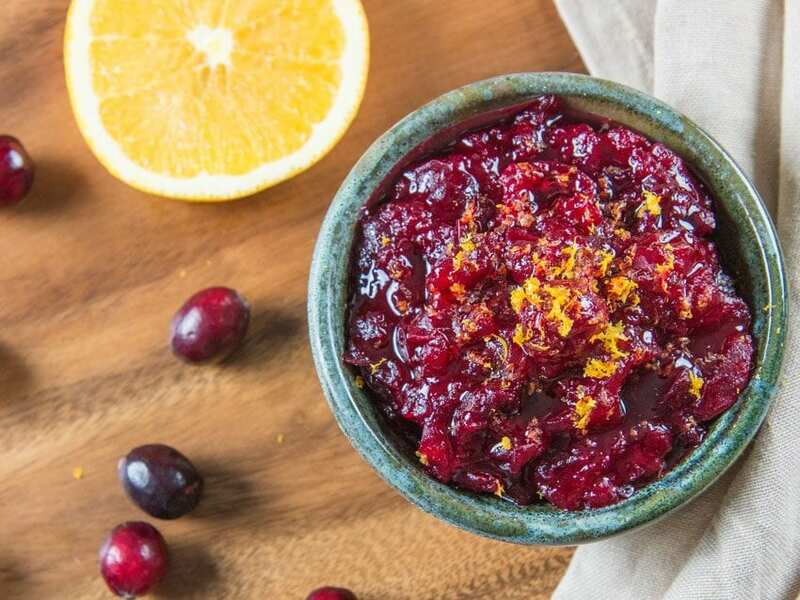 It’s everything and more you want for the perfect Thanksgiving side dish! 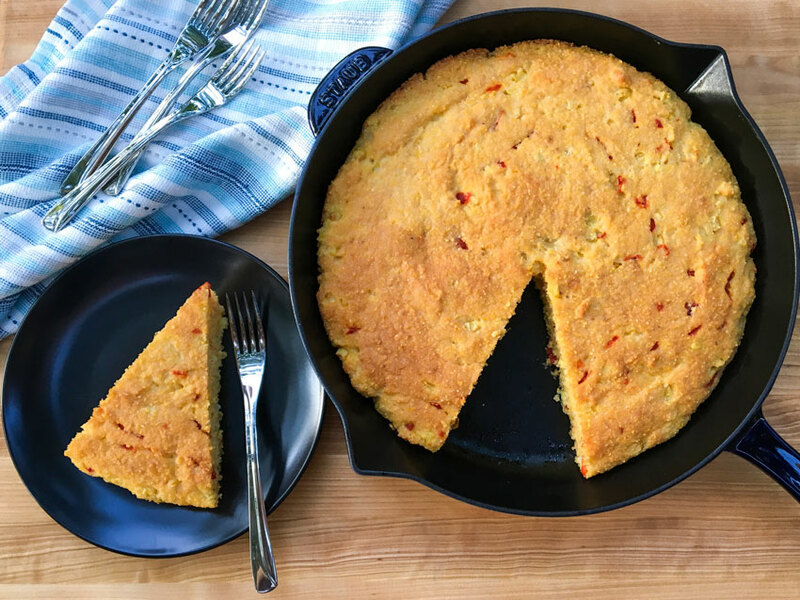 Try some other Thanksgiving side dish recipes like my skillet corn bread and homemade cranberry sauce. Preheat the oven to 425 degrees F along with a sheet tray inside. The reason you want to preheat the sheet tray before pouring the veggies in them is that you want the veggies to start caramelizing as soon as they touch the surface of the pan. This will create a beautiful golden brown color on the veggies that gives it so much flavor. Seasoning the veggies with avocado oil, salt, and pepper before pouring them in the pan. Since we are baking the veggies at a high temp you want to use a high smoke point oil like grape seed or avocado oil. The oil will help make the veggie crispy and golden brown. Baking the vegetables in the oven at a high temperature of 425 degrees F will make the exterior dark and crispy and make the interior soft and creamy. This is the best technique for how to cook vegetables in the oven. If you’ve been following me on the FlavCity IG stories, you’d know that I’m pretty much obsessed with delicata squash. Why, you ask? Well, for starters, you don’t need to peel it! 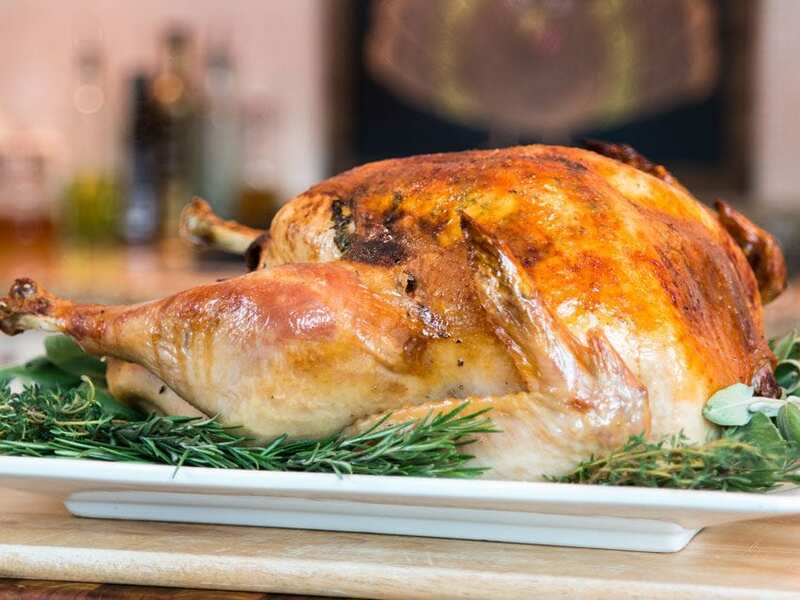 The skin is so delicate hence the name ‘delicata’ that once it’s roasted, you can eat the skin. 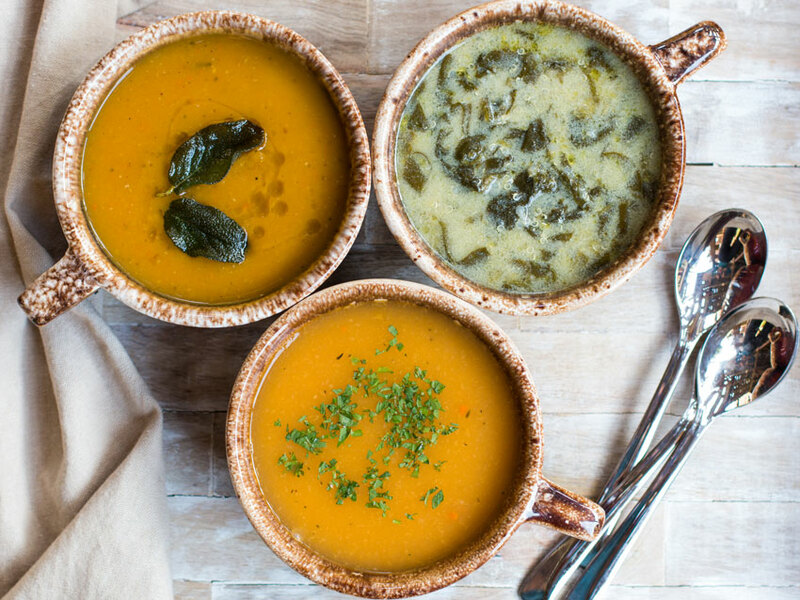 If you can’t find delicata squash, use butternut squash or acorn squash. Just be sure to use a knife and a rolling pin to safely cut the squash. Watch the video below to see how I do it. How To Make Hot Bacon Dressing? Preheat a nonstick pan on medium heat and add the thick cut cubed bacon. 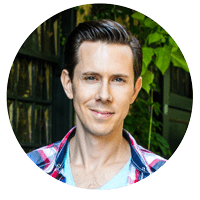 The idea is to slowly render out the fat, so don’t rush this step. It will take about 10 minutes. While the pan is still on the heat, add some walnuts for crunch, onions and garlic for spice, red wine vinegar for acidity, and maple syrup for sweetness. To emulsify it and bring it all together add some whole grain dijon mustard and mix well. This is the ultimate hot bacon dressing to pour oven freshly roasted vegetables. Pre-heat oven to 425 degrees F with two sheet trays inside. Slice a small piece off the ends of the sprouts and then slice them in half. Add sprouts to a bowl and season them with 1 tablespoon of oil, just under 1 teaspoon of salt, a few cracks of pepper, and mix well. Carefully cut the squash in half from top to bottom(no need to peel) and use a spoon to scoop out the seeds. I like to use a rolling pin to safely tap my knife through the squash. Cut the squash into 1/4 half moons and place them in a bowl and season them with 1 tablespoon of oil, 1/2 teaspoon of salt, a few cracks of pepper, and mix well. Carefully remove the hot sheets trays from the oven a place the sprouts on one pan and the squash on the other, making sure everything is in one single layer. Roast in the oven for 25 minutes and then remove the squash. Keep cooking the sprouts until they are slightly charred, about 5-10 more minutes. Once the sprouts are done remove from oven and set the oven to broil. Place the squash 8-10 inches from broiler and cook until slightly charred on both sides, flipping as needed. Remove and set aside. While the veggies are roasting, cut the bacon slices into small bite size pieces. Add the bacon to a medium size pan and place it over medium heat. Cook the bacon until most all the fat has rendered out and the bacon looks like it's getting crispy, about 8-10 minutes. Add the onions, garlic, walnuts, 1/4 teaspoon salt, a few cracks of pepper, and cook another 5 minutes. Lower the heat to medium-low and add the vinegar, maple syrup, mustard, and mix well. Taste for seasoning, you may need more vinegar or maple syrup. Turn the heat off the pan. Add the cooked sprouts and squash to a large bowl and pour over the bacon fat dressing along with 1 tablespoon of parsley. Mix very well and check for seasoning. Plate the side dish family style and garnish with more parsley, Enjoy!